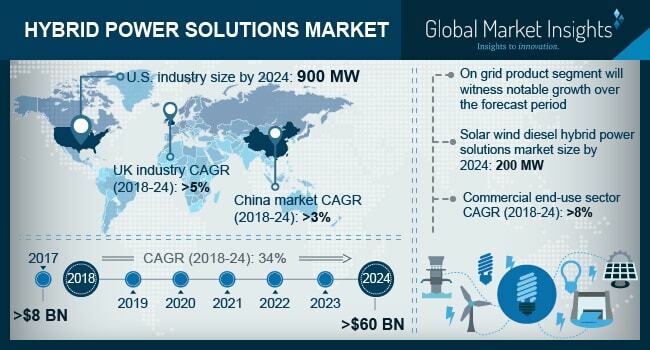 Hybrid Power Solutions Market size will exceed USD 60 Billion by 2024, as reported in the latest study by Global Market Insights, Inc. Growing demand for reliable and uninterruptible power coupled with increasing focus toward the grid integration of renewable energy will boost the hybrid power solutions market. Favourable initiatives to promote renewable energy along with the growing demand for decentralized power generation systems will augment the business landscape. In 2015, ABB and Vestas have introduced Wind for Prosperity initiative across remote areas of Kenya to ensure the clean power generation through Wind-Diesel technology. UK hybrid power solutions market is predicted to grow over 5% by 2024. Government focus toward raising the dependency on sustainable and effective power generation to achieve green energy economy structure will positively impact the hybrid power solutions market growth. Developers across the region are working aggressively toward the enhancement of CUF for their existing power plants. In 2016, Ecotricity announced plans for three new hybrid renewable energy parks that will be generating electricity with a mix of wind and solar energy with overall capacity of 5 MW. The company is approaching 100 MW generation from solar-wind technology by adding green gas mills as a part of new blueprint for Britain.